I have featured several meteor showers on this blog, like the annual Perseid Meteor Shower in August, and the November Leonids Meteor Shower. 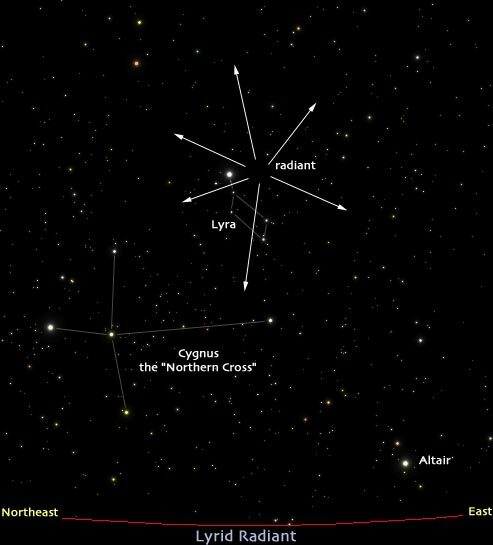 This time around, another faithful meteor shower, the Lyrids, invites us to make a wish upon a falling star. The Lyrids meteor shower has been observed for more than 2,600 years. Chinese records show that "stars fell like rain" during the meteor shower of 687 B.C. "The Lyrids are particularly interesting for two reason. First, observations have been identified back to at least 2600 years, which is longer than any other meteor shower. Second, the meteor shower occasionally experiences an outburst of about 100 meteors per hour and the reason is basically unknown." The first constellation I look for in the sky is Orion's Belt as I think it is the easiest to recognize. The center of the Lyrids meteor shower is, unfortunately, nowhere near this! Lol! The figure above shows it will be near the constellations Cygnus or the "Northern Cross" and Lyra. Good luck finding that. Haha. But do try. Who knows, your wish just might come true! "Falling star does not always mean a chance to wish and make your dreams come true. Sometimes, they were just teardrops from heaven, weeping with someone with a lonely heart." Tapos na, may nakuha ba kayong pictures? Pa share naman, di na ako lumalabas sa lungga ko...he he he....Regards.